Don't kid yourself. Real privacy no longer exists in this country. We've long had government organizations collecting data that paints a pretty clear picture of what we do with our time. The Internal Revenue Service knows everything about what you earn and any major transactions you make. It can access every bit of information it needs to determine how much money you should be sending on April 15. The most important gatherer of personal information in the country is the Federal Bureau of Investigation. It keeps a database of over 90 million fingerprints, which can be accessed by other law enforcement agencies. It also has an extensive database of DNA, the most specific marker of personal identity. The bureau's ability to collect information expanded following the terrorist attacks of Sept. 11, 2001. 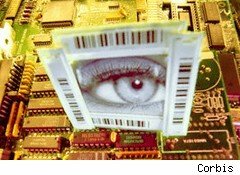 It now tracks a large portion of mail, cell phone traffic and Internet activity of people it deems suspicious. Thanks to advances in technology, however, there are also now numerous private enterprises that track and record your every move. Although they don't usually give out this information, there are often worrisome leaks and security breaches where they inadvertently release sensitive information about their customers. Taken together, these industries have data on where you are, who you are communicating with, how you are earning your money, how you are spending that money, as well as the hobbies and interests you are pursuing. With each firm having files on over 200 million people, the three credit bureaus -- Equifax (EFX), Experian (EXPGY), and TransUnion -- know not only your credit history, but also have the data to project your credit future. The companies collect a history of all credit use by an individual, including payment of bills, mortgages, and credit cards. The agencies also track the frequency with which a person applies for credit. That information is used to determine a person's credit risk through a credit score. These scores are produced using secret algorithms, ensuring that the bureaus know much more about you than you know about them. As cell phone popularity has increased and technology has evolved, cell phone companies have come to possess a wealth of information about their customers. Covering over 90% of the American population, cell phone providers can tell who you call, when you call, how often you call certain people and what you say in your text messages. With GPS, they also now know where you are whenever you have your phone. As smartphones become the equivalent of miniature computers, cellular companies can also track personal behavior, such as use of multimedia and wireless e-commerce transactions. In its ascent to Internet superpower, social enterprise Facebook has amassed an enormous amount of user information. Who your friends are, what you like, and what photos you are in are all information that the company has access to. That, however, is not the full extent of it. Facebook also tracks which profiles you view, who you communicate with most often, companies and causes you support, your personal calendar, and a great deal of personal information about your friends and family. Perhaps most surprising, Facebook can access much of the information you may have deleted, including photos and status updates, from their servers. There are currently 610 million credit cards owned by U.S. consumers. In an economy dominated by credit, the amount of power held by credit card companies, such as Visa (V), MasterCard (MA) and American Express (AE), should not be surprising. They know their customers' credit scores, credit histories, what they buy, when they buy, and when they are likely to default on their payments. The interest rates charged for credit fluctuates based on their analysis of individuals' ability to pay back the debts they incur. Some of the information kept by credit card companies can help consumers, however. Algorithms that study buying patterns, for instance, are used to detect fraud. Every search you perform on Google (GOOG) goes into the Internet giant's database, which it uses to keep a profile of your habits and interests. The search engine also keeps track of which links you click on during your search and which advertisers you visit. Google uses your interest profile and search history to place targeted ads in your browser. Perhaps most disturbingly, Google uses its Gmail service to monitor the content of your email in order to place targeted advertising in your email account. Google also keeps records of account and credit card information for everyone who uses their "Checkout" service, tracks which videos people watch on YouTube, where people are planning to visit, and what they plan to do there. Google's location-based map systems also allow the search company to know where people are in real time through the use of smartphones and other GPS-enabled devices. Walmart (WMT) uses data-mining services to collect and store information for all its customers in a central location. This allows it to determine the purchasing behavior of people who shop in its stores or on its website. It also optimizes inventory distribution by determining which products people are most likely to buy in the future. In August, Walmart began installing Radio Frequency Identification Devices (RFID) in their underwear and jeans, which lets them track items and customers around the store. This means they are able to determine how much time someone who buys a specific pair of pants spends in each aisle. Walmart plans to use this data to reorganize displays and further control inventory. The retail giant also sell this information to thousands of other businesses, who use consumer profiles for advertising and demographic research. Casinos like the Wynn Resorts (WYNN) are increasingly using "loyalty cards" to monitor the behavior of their patrons. The Wynn "red" cards are used in place of tokens, and allow the casino to keep track of which machines and tables each gambler visits on a regular basis, the path they take during their visits (using RFID chips), and even how often and how much they are willing to lose before giving up. When a slot machine in Wynn detects a gambler is close to his breaking point, it will issue a small payout in order to keep him spending money. Large banks, such as Bank of America (BAC), Chase (JPM) and Citibank (C), have access to customer account information, which includes savings, employer payroll deposits, and the time and date of ATM and teller visits. They track transfers made by account holders to third parties. A bank also knows your income, your salary, and your balance, moment-by-moment. Perhaps among the most confidential data a bank keeps is how often people move money in and out of accounts. Banks know how much you save each month, and often exactly how those savings are invested. Banks use this information to assess the risk of giving you a mortgage or loan, and they are legally allowed to use data-mining companies to check your website activity. About 140 million households currently have life insurance. In order to apply for life insurance, applicants generally must disclose their health history. This includes incidence of heart disease, height, weight, smoking habits, and often includes full records from your doctors. Perhaps more invasive, life insurers seek disclosure of hospitalization for mental illness, use of illegal drugs, and whether or not you have had to file for bankruptcy. Insurance companies use a national prescription database to determine whether or not you have ever been prescribed medication. And certain high-risk professions and hobbies usually have to be disclosed.